Air New Zealand is boldly moving forward with its longstanding aspiration to serve Latin America by announcing plans to launch service to Buenos Aires in 2015. The new Auckland-Buenos Aires route is made possible by a new partnership with Aerolineas Argentinas, which will provide connections within South America and local sales support. For Air NZ, Buenos Aires fills the last major white spot in its network following the upcoming resumption of services to Singapore. Argentina has proven to be a challenging market for foreign carriers but for Air NZ it represents the best South American option with a risk level that is acceptable with the right partnerships. For Aerolineas, codesharing with Air NZ provides an opportunity to add New Zealand and Australia back to its network. Aerolineas pulled out of the Southwest Pacific market in Apr-2014, leaving a void which Air NZ is eager to fill as it has the aircraft type and connections to succeed where Aerolineas failed. On 12-Dec-2014 Air NZ announced plans to launch three weekly flights from Auckland to Buenos Aires Ezeiza using 777-200s. Air NZ plans to begin ticket sales in Mar-2015, pending government approvals, and commence flights in Dec-2015 (an exact launch date will be announced later). Air NZ believes there will be sufficient demand to increase services to five weekly flights and eventually to daily, although maybe not on a year-round basis. Qantas' sole South American route, Sydney-Santiago, is served only four times weekly as of Dec-2014. New Zealand-Argentina is a tiny market that was abandoned by Aerolineas in 2012 when the Argentinean flag carrier eliminated the Auckland stop on its three times per week Buenos Aires-Sydney A340 service. Aerolineas had hoped operating non-stops would improve the performance of the route as a very small fraction of passengers were embarking or disembarking at Auckland. But non-stops to Sydney also proved to be unsustainable due to a combination of factors – including payload limitations, low yields and high fuel prices – leading to the late 2013 decision to withdraw from the market from Apr-2014. Air NZ sees potential to build up local New Zealand-Argentina traffic over time as more Kiwis look to holiday in South America, hopefully using Buenos Aires as a jumping off point, and economic ties grow from the current low base. But it recognises the New Zealand-Argentina market is limited and plans to rely heavily on sixth freedom traffic, particularly to and from Australia. Air NZ CEO Christopher Luxon told CAPA at the 17-Dec-2014 Star Alliance meeting in Delhi that an anticipated 35% of traffic for the new Auckland-Buenos Aires route will come from Australia. Australia has a large Argentine community and Buenos Aires is also a relatively popular holiday destination for Australians. Aerolineas’ withdrawal from the Australian market has left Qantas and oneworld partner LAN as essentially the only option between Australia and Argentina (with the exception of very circuitous routes via North America). 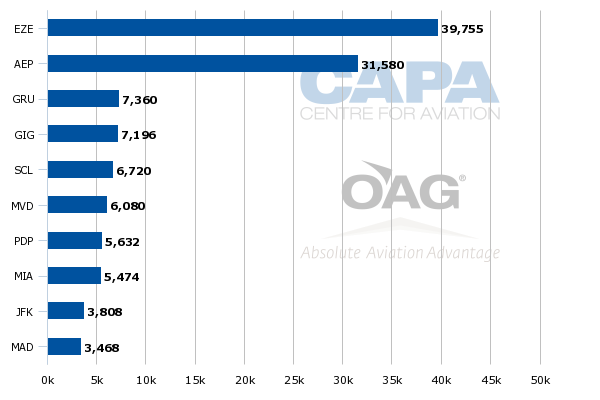 Indeed, Qantas and LAN are the only carriers with non-stop flights between Australia/New Zealand and Latin America. Qantas briefly provided a non-stop option until Mar-2012, when it dropped three weekly 747-400 flights on the Sydney-Buenos Aires route and instead launched Sydney-Santiago flights with onward connections to Buenos Aires operated by LAN. The Chilean carrier also serves Sydney but its daily A340 flight to Sydney operates via Auckland, resulting in a two-stop product for passengers heading between Sydney and Buenos Aires. Air NZ plans to offer quick connections in the Australia-Argentina market by timing its new Buenos Aires flights to connect with its Australia services. Air NZ in Dec-2014 links Auckland with six cities in Australia – Adelaide, Brisbane, Gold Coast, Melbourne, Perth and Sydney. Joint venture partner Virgin Australia supplements Air NZ on Brisbane, Gold Coast, Melbourne and Sydney. In all the other Australian markets Air NZ will be able to offer the fastest connections to Buenos Aires as it will provide a one-stop product while Qantas/LAN currently provides a two-stop product (or a three-stop product when using LAN for the entire journey). Air NZ particularly has high expectations for the Melbourne-Buenos Aires market, pointing out Victoria has a larger Argentinean community than New South Wales. The two carriers have been interlining for three years but a closer relationship is envisioned to help provide Aerolineas with more robust connections beyond Sydney. Transitioning the current interline arrangement to a codeshare will also help Virgin Australia, which is keen to build up its global network through bilateral agreements. Aerolineas in Jul-2012 dropped the Auckland stop on its Buenos Aires-Sydney route. Aerolineas is the only non-stop carrier now operating between the two cities as Qantas dropped the Sydney-Buenos Aires earlier this year in favour of a new Sydney-Santiago service. Aerolineas now serves Sydney with three weekly flights but has unveiled plans to add a fourth weekly frequency on the route in Dec-2012. Aerolineas also tried to improve the viability of Sydney by forging codeshares with other SkyTeam members that serve Sydney, starting with China Southern. But Aerolineas never implemented the codeshare with China Southern or any other codeshares beyond Sydney before dropping the route. Air NZ is also addressing another major weakness of the Aerolineas service by using a more efficient twin-engine aircraft. Aerolineas does not have 777s in its fleet and its A330s lack the range. Air NZ also has a much better in-flight product, which should help it compete against the Qantas/LAN combination. Aerolineas had to resort to competing on price as it had an inferior product and a relatively weak brand, resulting in fares which were unsustainable given the high cost of the operation. As Aerolineas is not planning to acquire new generation widebody aircraft with the range to serve New Zealand or Australia forging a partnership with Air NZ is a sensible option. Aerolineas is also now generally keen to build up its partnership portfolio, recognising it needs to rely on other carriers both within and outside SkyTeam to provide a global network. The Argentine government, which owns 100% of Aerolineas, is also keen to see the restoration of an air link across the Pacific. Cutting Sydney was politically difficult but had to be done as it was impossible for Aerolineas to break even on the route. Mr Luxon also expects connections to/from Asia to initially account for about 10% of traffic on Auckland-Buenos Aires. But Air NZ anticipates the Asian market growing faster over time than the more mature Australian market. Air NZ and Auckland Airport have long touted the prospects of tapping the emerging Asia-South America market, particularly China-South America. Air NZ currently serves Shanghai and Hong Kong and has Air China and Cathay Pacific as codeshare partners. There will also be opportunities to carry passengers to and from Southeast Asia. While Southeast Asia-South America is a much smaller market than China or North Asia-South America it is a market with fewer convenient options. For North Asia, connections via North America are generally quicker than they would be via Auckland. Pending regulatory approvals Auckland-Buenos Aires will be added to the codeshare partnership that Air NZ and SIA forged in Feb-2014 and will be implemented in Jan-2015. Under the alliance, Air NZ is launching services to Singapore on 6-Jan-2015. SIA will add Air NZ’s code on its flights to New Zealand and beyond Singapore to destinations within Southeast Asia as well as to South Asia, South Africa and Europe. Expanding the codeshare to Buenos Aires will give SIA access to a second South American destination. SIA currently serves Sao Paulo via Barcelona but does not have any codeshare destinations in South America. If Air NZ and SIA are able to codeshare on Auckland-Buenos Aires, the two groups will also be able to offer two-stop connections between Buenos Aires and a wide range of markets throughout Southeast Asia. Southeast Asia-Argentina is not a large market but a few incremental passengers could make the difference between a loss and profit. 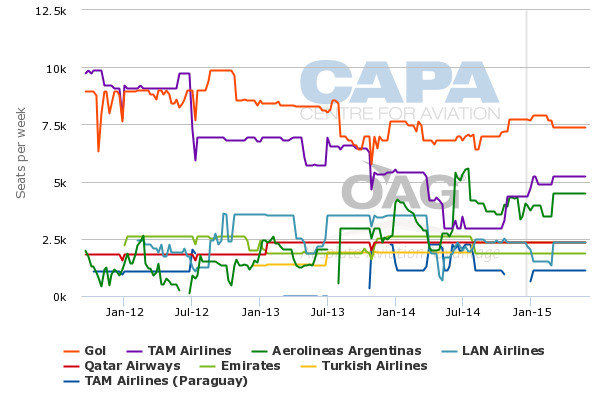 Securing approval for third country codeshares can be challenging in Argentina. But having Aerolineas support should make a huge difference for the Air NZ-SIA application. 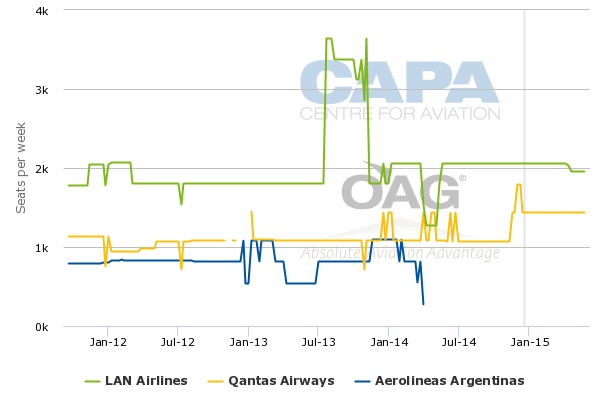 During its time in the Buenos Aires market Qantas was not even able to get approval from Argentina to codeshare with LAN Argentina, which has had a rocky relationship with the current government. The Argentina market can also be challenging commercially for foreign carriers given the country’s frequent economic problems, a factor Qantas cited in its decision to switch South American services to Santiago. South African Airways also pulled out of the Buenos Aires market in Mar-2014. Having Aerolineas as a partner, however, changes the dynamics significantly. Aerolineas currently accounts for about a 25% share of international seat capacity in Argentina’s international market. Aerolineas will certainly help Air NZ with local sales and make it easier from a regulatory standpoint. But Aerolineas’ split hub strategy makes it challenging to pursue transfer traffic beyond Buenos Aires. Aerolineas has about 45% of its international seat capacity and almost all of its domestic capacity at Buenos Aires Aeroparque (AEP) rather than Ezeiza, which is the only Buenos Aires airport capable of handling widebodies. Mr Luxon however expects traffic to be heavily leisure, and passengers will be likely to visit Buenos Aires and other South American destinations, meaning they may not need a connection on one leg of their itinerary. A visitor could fly into Buenos Aires Ezeiza and stay in the city before continuing the trip out of Aeroparque. But if airport transfers are needed, there is a bus service and this can be booked in the GDS, according to Mr Luxon. Air NZ plans to offer some connections beyond Buenos Aires and has stated it plans to codeshare on Aerolineas-operated flights to Brazil. But Air NZ at least initially will focus primarily on connections at the New Zealand end. The focus on the New Zealand end is sensible given the opportunities in the Australia and Asia markets and the limitations in Buenos Aires for connections. For example Aerolineas only operates one daily flight from Ezeiza to Sao Paulo compared to four daily flights from Aeroparque to Sao Paulo. Rio de Janeiro is served by Aerolineas with one daily flight from each Buenos Aires airport. But two secondary Brazilian destinations, Curitiba and Porto Alegre, are only served from Aeroparque. Air NZ looked at serving Brazil directly but would have faced payload restrictions on the return sector while Buenos Aires can be operated without any payload restrictions in either direction. Air NZ also concluded the Brazil market was fragmented and therefore would require domestic connections from Sao Paulo. Air NZ can potentially offer connections to the same Brazilian points via Buenos Aires although more Aerolineas flights from Ezeiza to Brazil – or a second partner for the Buenos Aires-Brazil market such as Gol – would certainly help. Gol, which has a codeshare partnership with Aerolineas, currently operates 42 weekly flights to Ezeiza from seven Brazilian destinations. Gol has twice as many flights on the Ezeiza-Sao Paulo route as Aerolineas and serves Ezeiza from the two Brazilian destinations that Aerolineas only serves from Aeroparque – Curitiba and Porto Alegre. 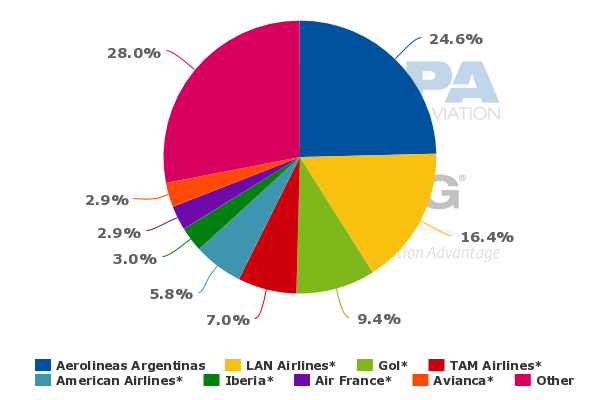 According to CAPA and OAG data, Gol currently has about 7,700 weekly one-way seats from Ezeiza while Aerolineas has only about 4,000 weekly one-way seats in the Ezeiza-Brazil market. Air NZ for now is not interested in partnering with the Brazilian LCC but over time it may need to look more closely at improving Brazil connections. Brazil is by far the most important connection market on the Latin American end. There will also be opportunities for Air NZ to serve Chile, Paraguay and Uruguay via Buenos Aires. But these are all very small markets and are not well connected with Ezeiza. Aerolineas operates only one daily flight from Ezeiza to Asuncion, Montevideo and Santiago as these destinations are mainly served from Aeroparque. Another limitation is Aerolineas’ small number of regional and domestic flights from Ezeiza that are timed to connect with its long-haul flights and flights operated by other SkyTeam carriers. These may not mesh well with Air NZ’s schedule as the airline will be focusing on timing flights for connections to Australia on the Auckland end. Air NZ could potentially work with other airlines serving Buenos Aires, including Star members Avianca and Copa. But again it may be challenging in some cases to offer quick connections in both directions. Avianca currently serves Buenos Aires with two daily flights from Lima and four weekly flights from Bogota. But Ezeiza-Lima and Ezeiza-Bogota are also markets served by Aerolineas, with one daily and four weekly flights respectively. Aerolineas would likely prefer to keep passengers connecting from Air NZ on its own metal. As part of its evaluation of potential South American gateways Air NZ looked at serving Lima, where it could have leveraged Avianca’s hub to offer connections throughout South America. But while Lima was a better option for connections it is a much smaller local market. Copa is the only carrier in the Buenos Aires-Panama City market, operating 24 weekly frequencies. But New Zealand-Panama is a small market and is better served via Los Angeles, which is a gateway for both Air NZ and Copa. Given the limited options at Ezeiza, Air NZ will clearly need to rely heavily on the local Argentinean market, the Argentinean community in Australia and Kiwis or Australians interested in stopping over in Buenos Aires before continuing their holidays elsewhere in South America. This should be sufficient to support the initial three weekly flights, particularly when factoring in efforts by Tourism New Zealand to boost visitor numbers from South America. Tourism New Zealand opened an office in Sao Paulo in late 2013 as part of an initiative to stimulate visitor numbers from South America. Air New Zealand is reviewing options for covering Latin America, which according to CEO Christopher Luxon remains the last white spot in the carrier’s network after plugging all its other holes with its new Singapore Airlines (SIA) partnership. While Mr Luxon’s predecessor Rob Fyfe for several years talked up the prospect of building Auckland into a niche hub for the Asia-Latin America market, Air NZ has never come close to pulling the trigger on a South America route. Mr Luxon says since he took over from Mr Fyfe at the beginning of 2013 improving the carrier’s network in Southeast Asia and Europe has been “the biggest priority”. With those parts of the puzzle now complete, Latin America will get more attention but Air NZ is still not likely to launch a service across the South Pacific to South America in the near to medium-term. See related report: Air New Zealand reviews options for Latin America. Can new partner Singapore Airlines help? The solution for South America emerged more quickly than anticipated as meetings with Aerolineas, which began six to nine months ago, were fruitful. Aerolineas has a chequered history and has not always been known as an easy airline to work with. But Mr Luxon found Aerolineas a willing partner and was particularly encouraged by the carrier’s transformation, including a new short-haul product. Aerolineas-Air NZ may seem like an odd duo but it is logical as there are clear benefits for both sides. The Auckland-Buenos Aires route would likely never be viable without a close partnership. Sustaining the route on a regular year-round basis will still not be easy. But with the right commitments and marketing strategies – and the prospect of growing connections to Asia – the route should eventually prove successful. And Air NZ’s vision of providing a connection to South America will finally become a reality.